A flour mill on boats on the Ohio River was built in 1791 by early settlers in the "Northwest Territory" due to low water and fear of attacks by Native Americans. In both cases the larger boat and structure were on the shore side for easier access by boats. The larger boat was 45 feet long, 10 feet wide and held the grinding stones and equipment. The smaller 5 foot boat or canoe held up the wheel. 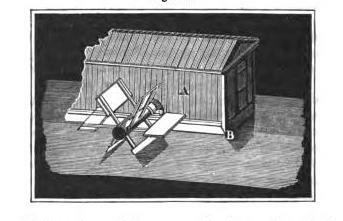 The two were joined by the wheel and by heavy cross beams at 8 feet apart. Depending upon the water current the mill was able to grind 25-50 bushels in 24 hours. The anchor to keep the boats in place was made of logs and filled with stones, connected to the main boat by a chain, and a grape vine held the smaller boat to the anchor. The builders, and mill owners were interesting men. The floating mills (and later stationary ones) were built by Capt. Jonathan Devoll (1756-1824) a ship's carpenter from RI who also constructed the fort "Farmer's Castle" barges and ships. Griffin Greene (1749-1804) also from RI had seen some boat mills working in Holland; he was appointed to help his cousin Gen Nathaniel Greene with the Quartermaster corps during the RevWar and later became a director in the Ohio Company. That year,1791, Chief Little Turtle led 1,000 Native American troops to defeat the cavalry, one reason the mill on boats was set in the middle of the Ohio River with an anchor of logs and stones. Chief Little Turtle would visit his friend George Ellicott - cousin of the surveyor Andrew Ellicott (who wrote about the floating mill in 1796, below) - at his home in Ellicott's mills in 1807. Mad Anthony Wayne would defeat the confederation. Five years later, the 1791 floating mill was described by one of the miller sons who founded Ellicott City: Andrew Ellicott. He was selected by President George Washington to survey the southern boundary of the new United States from the Mississippi to the Atlantic Ocean. 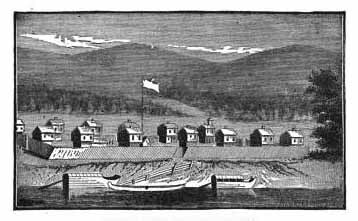 Ellicott left the settlement of Marietta, Ohio on the Ohio River going 12 miles south to Belle Prae (Belle Prairie, now Belpre) where he saw the floating mill. "Nov. 11th 1796 Passed the little Kanhawa, and afterwards a miserable village by the name of Belle Prae, next a floating mill, and lastly, the mouth of little Hockhocking. The ordinary streams of water in that part of the western country, so universally fail in the summer, and beginning of autumn, that the inhabitants are under the necessity of having recourse to floating mills, or to others driven by the wind, or worked by horses to grind their corn. Those floating mills are erected upon two, or more, large canoes or boats, and anchored out in a strong current. The float-boards of the water wheels, dip their whole breadth into the stream; by which they are propelled forward, and give motion to the whole machinery. When the waters rise, and set the other mills to work, the floating ones are towed into a safe harbour, where they remain till the next season. 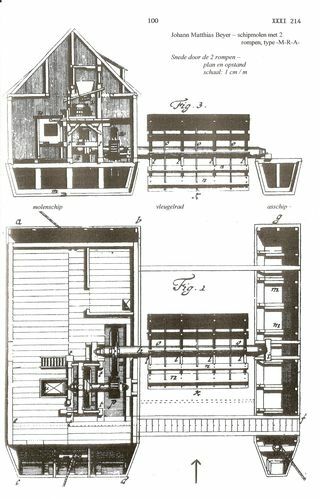 Although floating mills are far inferior nevertheless more to be depended upon than wind mills, and may be considered as preferable to those worked by horses. ... Encamped opposite to a miserable village called Belle Ville : made 24 miles this day. Fog in the morning, and smoky all day. — Thermometer rose from 37° to 66" — Water in the river 45°." "The Romans had also floating mills. These carried paddlewheels, so that, when moored in the rapids of rivers, or at bridges, the wheels were forced round by the current, and the millstones driven in the ordinary way, as in canal mills. In examples of this kind the millstones were most probably below the axles of the water-wheels, the bottom of the Darges serving; for the floor of the mills. A number of these barges, or floating mills, moored across a river, would make a rapid anywhere, by damming back the water, so that the head-current would stand lighter than the tail-water, just as we see at bridges and the like. The old tide-mills of this country were, doubtless, copies of the floating mills of the ancient Romans, at least in principle, if not in the details of much special mechanism."